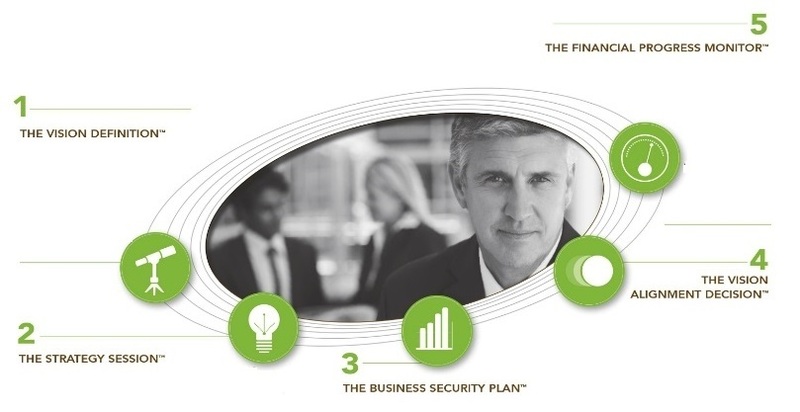 The Business Security Solution helps you define the vision and strategic plan you have for your business. Whether you are trying to establish the right type of qualified retirement plan or dealing with the structure of a succession plan, we are familiar with the various business planning decisions before you. We integrate your business and personal financial planning objectives in a cohesive written plan. Our process begins with a personal interview designed to identify the vision and strategic plans that you have for your business. Out of this stage emerges a business philosophy that can guide you in designing employee benefit programs for key employees and strategies for business continuity. In the Strategy Session™, we organize your financial documents and build a detailed profile so that we may precisely understand your company’s balance sheet; identify risks that can adversely affect the assets of your business; and address them in the context of your current plan. By carefully arranging your business documents and records, you’ll gain confidence in knowing where you’ve been and where you’re heading. Applying our knowledge of current issues affecting successful business owners, we prepare and offer recommendations that compare your current financial condition to alternative models using clear, understandable language. An outcome of this stage is a written Business Security Plan that addresses the most important goals you have for your business, your family and yourself. With goals in sight, great care is taken to ensure that your implemented plan is aligned with your vision. As your unifying voice in the planning process, we create a welldefined action plan that contains sequenced steps, guidelines and due dates. As part of this stage, we provide an objective evaluation of possible employee benefit models that can improve the retention and motivation of your key employees. To ensure that you have adequate resources for yourself and your business, we establish regular reviews to gauge your plan’s performance, and make adjustments for changing laws, regulations, market conditions, and investment performance. This commitment to measure your progress also takes into account your changing personal and financial circumstances.